TORONTO — Having too many cooks in the kitchen wasn’t a problem yesterday at Toronto’s Cirillo’s Culinary Academy, where the St. Kitts Tourism Authority hosted a fun and interactive cooking lesson, Caribbean style. 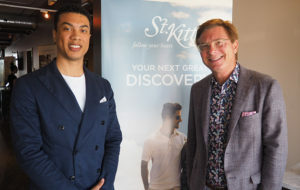 The Tourism Authority’s Paul Minich, Market Consultant, and Jack Widdowson, Marketing Officer, invited travel agents, industry partners and media to roll up their sleeves and prepare a feast that included dishes like Jerk Chicken Kebabs, Crab Cake Sliders and Cane Sugar Glazed Pork Meatballs, each of which is a signature dish at a luxury hotel in St. Kitts. The event, said Minich, was meant to do three things: highlight new offerings in the destination, tease guests with a taste of St. Kitts’ culinary scene, and do it all in a way that was fun. It worked. From prep to finish, guests had a great time learning about the two-island nation of St. Kitts and Nevis, how the destination has changed and, more importantly, how it hasn’t. His response is always the same: Absolutely and absolutely not. Minich listed several new ultra-luxe accommodations that are changing the face of the destination, like the Park Hyatt St. Kitts Christophe Harbour, and the St. Kitts Marriott Resort & The Royal Beach Casino. A few properties will be undergoing renovations like Four Seasons Resort Nevis, while others are counting down the days until their grand openings. These include the highly anticipated Ritz-Carlton in 2021, which will boast 125 suites plus 25 branded villas and residences on the Southeast Peninsula of the island, as well as a Six Senses, also in 2021, featuring 70 pool villas with plunge pools, teen centre, kid’s club and the Six Senses Spa. Even nearer still is a Koi property in 2019, situated on 15 acres of beachfront and featuring multi-storey Resort Studios and Suites, beach and pool villas, and a three-bedroom Penthouse. All this amounts to a level of luxury never before seen on the island, which Minich admits is not an all-inclusive environment. From having met so many travellers, he’s determined that they can all be categorized into two groups: those who love all-inclusives, and those experiencing all-inclusive fatigue. St. Kitts, obviously, appeals to the latter. Even before clients arrive at hotels, their luxury experience begins upon arrival at Robert L. Bradshaw International Airport. There, they’ll be whisked away in a Porsche to Yu Lounge, a private five-star air terminal located adjacent to the main terminal building where they’ll be treated to champagne service, gourmet dining, Wi-Fi access, secretarial services and a concierge who can book hotel transfers, restaurant reservations and local activities. Though primarily used by travellers flying privately to and from St. Kitts, the lounge is also available to passengers on commercial flights. This is great news for the countless Canadians arriving via Air Canada’s direct service from Toronto. And as a sign of faith in the destination, the airline has recently announced that it will be expanding its St. Kitts service to six months, running from Nov. 3, 2018 to April 27, 2019. 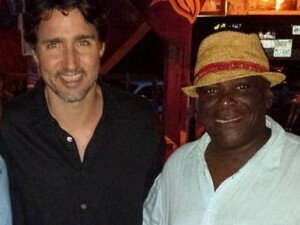 He added that Canada, as the #2 international market, is incredibly important to St. Kitts, particularly in the golf segment. Home to two championship golf courses with another two under construction, St. Kitts has become a must-golf destination among Canadians. “Last year, we saw a 330% spike in golf searches on the Internet from Canada. Canadian golfers is definitely our biggest golf market,” said Minich. For more information on travel to St. Kitts go to http://www.stkittstourism.kn/.